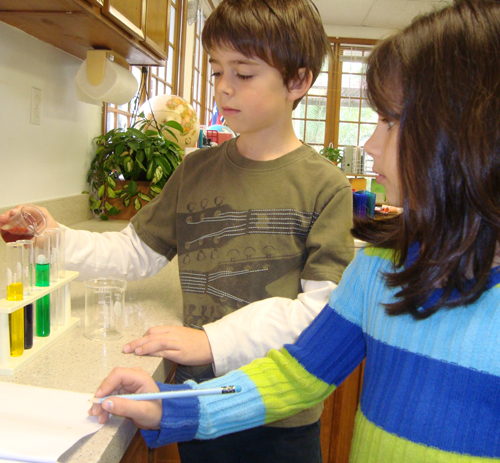 When you step into our elementary classes, you will observe the buzz, the motion, the excitement of active learning. Our curriculum minimizes tedious, rote learning, and maximizes hands-on, interactive learning, which research shows to be more effective. Each child makes decisions and judgments, manages work time, and solves problems every school day. Our goal it to provide the students with a safe environment to develop critical thinking skills and high order reasoning. In this supportive environment, the students understand that mistakes are opportunities to expand learning. Our whole child approach to education ensures that the academic, emotional, and social growth of the child reaches the child’s maximum potential. The Riverbend Elementary program emphasizes math and language fundamentals. We are able to accelerate progress through the math and language curricula because of the conceptual nature of our concrete materials and because of our individualized programs. The children formulate math concepts using concrete materials that enable them to grasp difficult concepts more completely and at an earlier age. Working with each student individually, we provide materials and guidance for the child to read and to work at her own level, regardless of age. The teacher reviews each student’s work each day and outlines a personal work program for that student. The children write daily in an extensive writing curriculum. Each student learns to define a project and determine the questions to be addressed. The student then learns to find the information necessary, organize the data, and express it in correct written form. Students also work on various forms of creative writing. Literary Circles, art, music, and physical education programs enhance the children’s education. Special programs such as Authors’ Tea, Arts Festival, and theatrical performances encourage poise and confidence in making oral presentations before an audience. Through many opportunities each day for a variety of interactions with teachers and peers, the children develop leadership and social skills. With the guidance of the teachers they learn to follow their curiosity, use their creativity, and utilize their research skills to increase their knowledge of the world.